Rick Rubin and Russell Simmons launch Def Jam Records. Run-D.M.C. release their debut self-titled album. The Fat Boys release their first album. 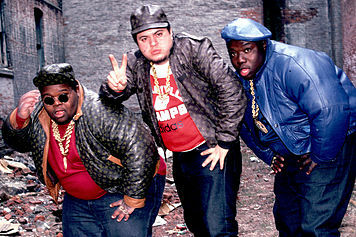 5 Reasons You Should Remember The Fat Boys as More Than Just a Novelty Act. 5. The Fun. Once upon a time there was a moment in music history when rap was fun. Rappers took their music seriously but still managed to have a sense of humor. 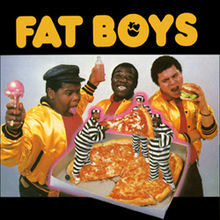 The Fat Boys excelled at the art of being goof balls while displaying skills that demanded respect. In other words – they had confidence. You don’t change your group’s name from The Disco 3 to The Fat Boys without a sense of humor and self-possession. 4. The Beatbox. Big Buff Love, the Human Beatbox (along with Doug E. Fresh) elevated beatboxing to an art form. I hear that sound and I’m immediately transported back in time to 1984. I admit I attempted to beatbox in my bedroom (who didn’t?) but, 30 years later, I have yet to go public with my skills. plain and simple I need food! Hemingway and Carver would envy this spare, yet powerful verse. This has been my mantra on many occasions. With proper respect to Queens (for giving us RUN-D.M.C. and my favorite hip hop group, A Tribe Called Quest) The Fat Boys are part of a select group of legendary rappers to hail from New York’s greatest borough (yes, I did). Hip Hop would not be the same without the contributions of Brooklyn rappers Big Daddy Kane, Jay-Z, Mos Def, Notorious B.I.G., Talib Kweli, MC Lyte, AND The Fat Boys. Before Brooklyn churned out artisanal cheeses and craft beers, it gave us hip hop artists who would sell millions of records and elevate the art form of rap. 1. The Legacy. Ok – so they would go on to make the movie Disorderlies and record duets with Chubby Checker and The Beach Boys. I won’t argue the artistic merit of any of those projects – except to say that they were all hits (pause for a moment and think about this fact: People paid money to see Disorderlies.) But if you listen to their first two albums I think you’ll hear why so many people – including Jay-Z (‘First The Fat Boys Break-Up, now every day I wake up/Somebody got a problem with Hov’) think The Fat Boys deserve to be remembered with respect. This entry was posted in Tribute and tagged 1980s, 1984, Beatbox, hip hop, Jay-Z, Kool Rock-Ski, Music, nostalgia, Pop Music, Prince Markie Dee, rap, The Fat Boys on May 16, 2014 by Sean.